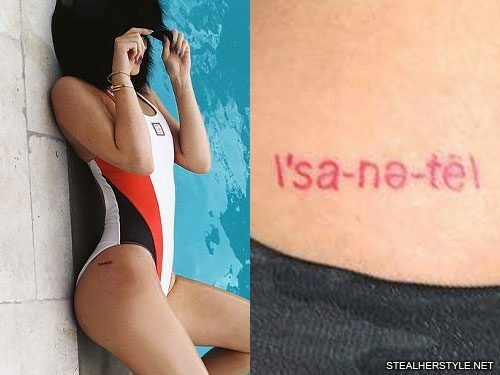 Kylie Jenner elaborated on her existing hip tattoo in July 2016. She added the word “before” to the left of the “sanity” tattoo which she got six months prior. “Sanity” is spelled out with the phonetic alphabet like in a dictionary, as “\ˈsa-nə-tē\,” while “before” is written normally. 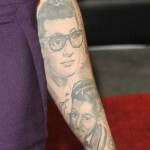 The two parts of the tattoo blend together seamlessly though they were actually done by different artists. 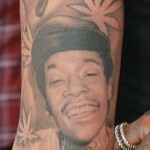 The original text was inked by celebrity-favorite Bang Bang back in December 2015; but she chose Rafael Valdez, who had done many of her then-boyfriend Tyga’s tattoos, for the rework. Kylie Jenner has moved on from Tyga and she’s got the ink to prove it. 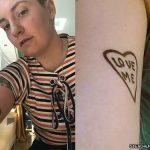 The reality TV star inked a tiny “t” on her ankle in November 2016 after years of dating of the rapper, but only six months later the relationship and the tattoo had both been replaced. While her relationship with Tyga was always rocky and on-and-off, it’s been smooth sailing with new beau Travis Scott. They got their own pair of matching tattoos, butterflies on their ankles, in May 2017. At the same time, she covered up Tyga’s initial and transformed the “t” (?) into an “LA” (??) for her hometown of Los Angeles, California. Kylie Jenner and her friend Jordyn Woods went to artist Jon Boy in May 2016 for these matching pinkie finger tattoos. 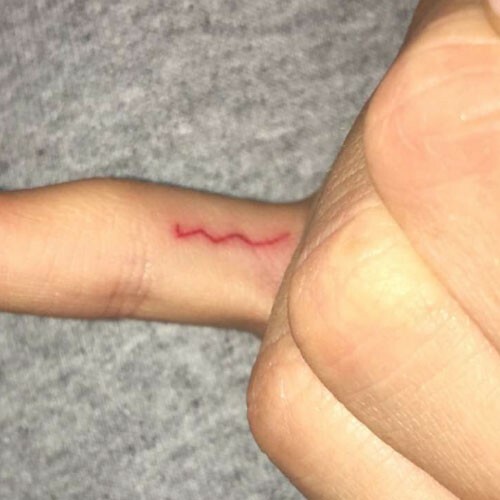 It is a handwritten lowercase letter “m” in red ink. As for why she chose the dictionary-style “\‘sa-nə-tē\” rather than simply writing the word, no one really knows. Her tattoo artist Bang Bang explains “It’s a really easy tattoo to misinterpret, so I think that she wants to explain it on her own terms.” Kylie got connected with the artist through her then-boyfriend Tyga, who knew one of Bang Bang’s repeat clients Chris Brown. 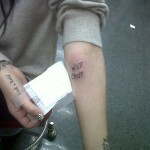 She and Bang Bang hit it off and she even tattooed her initial “K” with a crown on his leg. “We clicked right away. She had a really clear idea of what she wanted to get, so I got straight to work,” he says. Kylie posted videos on her Snapchat of their tattoo session but waited a while before revealing what tattoo she got for herself. 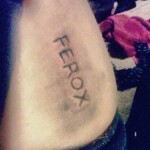 She later updated this tattoo by added the word “before” in front of it. 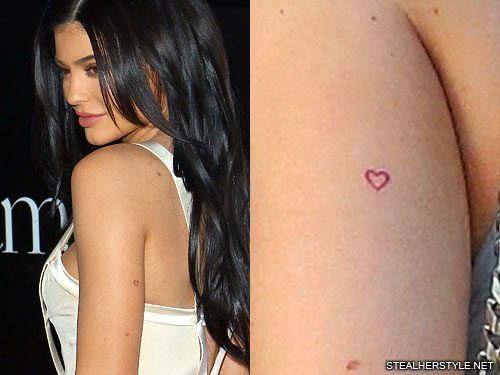 Kylie Jenner’s first tattoo was a small red heart on the back of her upper left arm. 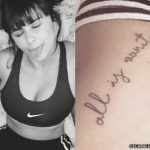 She waited until she was 18 to get inked because her mom Kris Jenner wouldn’t approve otherwise — but she didn’t wait long! 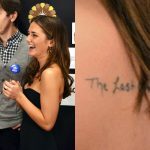 She debuted the new tattoo at her 18th birthday party in August 2015. The outline of a heart is a matching friendship tattoo with a group of her closest gal-pals. 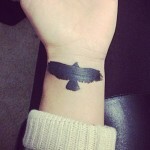 They got inked together but each chose a different body part: Jordyn Woods got a heart behind her ear, Anastasia Karanikolaou aka “Stassiebaby” got a heart on her forearm along with her sister’s birth date, and Justine Skye got a heart with three dots on her knuckle. Kylie is the only one who opted for red ink. There are many rumors that the heart is also a tribute to her heavily-tattooed boyfriend Tyga. 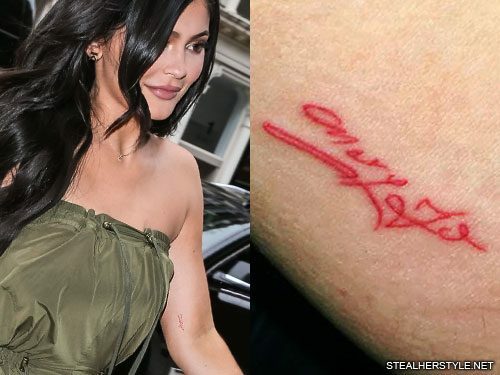 Kylie has never confirmed this herself, but an insider source told Hollywood Life “Kylie got her new heart tattoo to symbolize all the love in her life — and obviously Tyga is a big part of that. He has her heart completely, so of course he was on her mind when she chose the design. Fortunately, she’s smarter than to get his name permanently inked on her.” Not that smart apparently, because she did end up getting his initial on her ankle as her fifth tattoo. Fortunately it was small and the cover-up was easy. 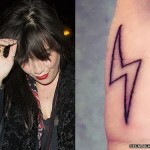 She has never covered up this heart, which shows that the tattoo is about more than just Tyga.